These face shields come in either 4" crown protector for low-weight protection or 7" crown protector for an extra margin of protection when harsh working conditions require it. Order the crown protector and faceshield separately to suit your needs. Molded from NORYL, which is used in welding helmets, these face shields are stronger, more durable and more heat resistant than those made from ordinary material. 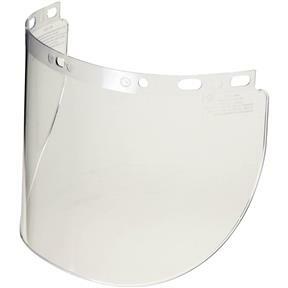 THIS SHIELD HAS FAR BETTER CLARITY THAN THE 'BIG BOX' AND CHEAP-O TOOL VENDOR OFFERINGS. IT IS ALSO LESS SCRATCHABLE THAN THE OTHERS. AS LONG AS YOU RINSE OFF WITH WATER BEFORE APPLYING DETERGENT FOR CLEANING, IT WILL LAST A LONG TIME.